This week was, hmm, lazy. The heat kept me from doing everything I planned to (excuse! ), and my body was still recovering from the busy weekend which included a secondary school reunion (plenty of girl talks), delivering a session on Our Lady to a group of Catechumen, running up and down the Cathedral hill for meeting/ To recover, I went shopping for my wedding shoes (girlfriend G helped out with this one, a lot). I'm planning on kicking off a new round of 100 Day Spending Ban in September, which will approximately end in early December - perfect timing to treat myself some presents for Christmas. Details to come in next week's update! Prosource Extra Virgin Coconut Oil 250 ml, a product of the Philippines. A gift from a relative. Caleb's Organic Virgin Coconut Oil $25 15 ml Product of Sri-Lanka. Purchased from Bonjour. Koconae Coconut Lip Balm. Souvenir from Thailand. Aside from the coconut lip balm mentioned above, from A, I also met up with another friend who handed me some bits. Lavshuca Lav Hearty Eyes "PK-1" and Biore UV Aqua Rich Watery Mousse Water Base from W. She finds the Biore sunscreen Mousse (silver tube) too heavy on her oilier skin, so I swapped with her my Essence (blue tube) - pictured here! She reported back she enjoys the blue tube much better, I'm glad! Revlon, at Sasa, and Bourjois, at selected Watson's, were having amazing deals with their nail polishes. I purchased the Revlon at buy two get one (paid $50 in total), and the Bourjois with 25% off (paid $175.50 in total). Been wearing the Bourjois for many days straight, no top coat, on both toe and finger nails - minimal chipping and brilliant impact. I want to go back and get more! I also picked up an Anna Sui Nail Color N "325" with a lovely discount! $98 instead of $125, 8 ml. I'm not a typical clothing shopper. Perhaps I acquire new pieces for my wardrobe only every quarter, or less. However, when it comes to jeans, I'm hopeless. Recently, like a few months back, Top Shop opened a store in town. After I have cleared out some 70% of my wardrobe (the kick-off of my de-cluttering project), I find it justified to replenish on some fitted skinny jeans. Hearing a lot of fashion bloggers or youtubers mentioning the Leigh Jeans $499, I went in and tried on a pair. Fell in love. However, my size is nearly out of stock. Only managed to buy the two colours available, a pair of black, and a pair of washed medium blue. Feeling incomplete and unsatisfied, I rushed to a Zara and then an H&M, craving for more. In the end, in just one afternoon, I hauled six pairs of skinnies (1 Zara Trafaluc Jeggings $259, 3 H&M $99, $99, $179). While I was at these three stores, I, of course, picked up some beauty bits. H&M make up is pretty crappy, therefore I went for a set of two midi rings $29.90 - a heart and a rhinestones band. Zara makes some of my favourite perfumes, and I'm an avid collector; got a roller ball in Zara "Zara Woman Milano" $49 10 ml, which is pink and has shimmer! I believe Zara creates special edition for special stores around the globe. In the past I've bought a men fragrance named after the Ginza, Tokyo store. Last but not least, I purchased four Top Shop Nail Polish in "DareDevil" "Pool Party" "Prim and Proper" "Dark Knight" $99 for 2, 8 ml each. 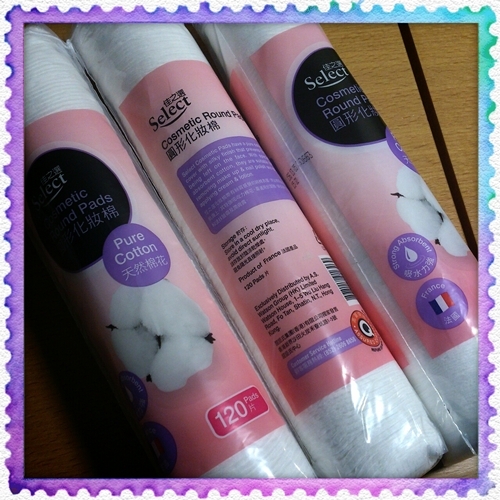 Some good basic cotton rounds. These are from supermarket's own brand and are product of France. With buy two get one promotion, totally cost me $31. Not bad. The perfect lazy girl, lazy day base make up. I will repurchase paying full price, no complaint! N/A - I've been reading the September issue of Allure on my iPad (I'm subscribed thanks to Mr. A). There's a feature on 'Surprise Skin Sins' >> highly recommend! Kiko Dark Heroine Fall 2013 Collection - Preview by another blogger link! Are you going back to school this Autumn? Whether you are or not, are there any new plans for you in the coming new month of September? I'm planning on a shopping ban, too! very nervous about it. I'm planning on a shopping ban, too!